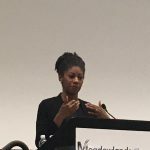 Zakiya Smith Ellis, commissioner of the New Jersey Department of Higher Education, touted college students working internships as a key to opening avenues to professional jobs during a keynote address Tuesday. A native of Georgia, Ellis disputed a misconception about the more people who earn a college degree results in the degree being less valuable. One travesty is that some college students not do internships. Additionally, adults may not be able to advance in a career without a bachelor’s degree so they return to college. They will then mortgage their house or take money from their retirement account to pay for tuition. Many community colleges have tuition and fees of $2,000 to $4,000 per semester, which is still a barrier, she said. “We have to do something that gets at that value proposition,” she said. The second major idea surrounding college being a cost that is worth paying centers on people-learning skills that are worthwhile, Ellis said. She noted New Jersey Gov. Phil Murphy will present his budget this month. Smith and her colleagues asked college administrators how they determined the needs of programs and they responded that student demands trump labor market demands. On the subject of certification, Ellis sees value in this form of education. Tammy Molinelli of the Bergen County Workforce Development Board moderated a panel discussion. “Small- to medium-sized businesses want to hire people in the next 12 months, but the challenges are where to find people,” Molinelli said. Ramapo College President Peter Mercer said Ramapo teaches students to do a mock interview, prepare a resume, and give a brief summation of their occupational skills. “There are a million people in New Jersey who have college credits but no degree,” Mercer said. Thomas Eastwick, president of Eastwick College and the HoHoKus Schools, offers 25 programs including 15 programs of trade certifications and apprenticeships. Luke Schultheis, vice president of enrollment, planning, and effectiveness at Fairleigh Dickinson University, said professional studies and business studies are important. Francine Andrea, vice president of administration at Felician University, said Felician has devised programs that allow students to switch careers, be innovative and partner with businesses to create stackable credentials with people who are already in the workforce. Berkeley College President Michael Smith considers technical sales the most important occupational skills, because this represents the ability to communicate. “Every Berkeley degree comes with an internship,” Smith said. Virginia Bender, assistant to the president for planning and chief of staff at Saint Peter’s University, strives for students to be educated in careers and to live purposefully. “We are very much at the forefront of what is happening in the market,” Bender said. Bergen Community College President Michael Redmond said his priority is educating students to join the workforce. Jim Kirkos, president and CEO of the Meadowlands Chamber of Commerce, is focused on creating relationships between the educational community and business community to grow the economy.